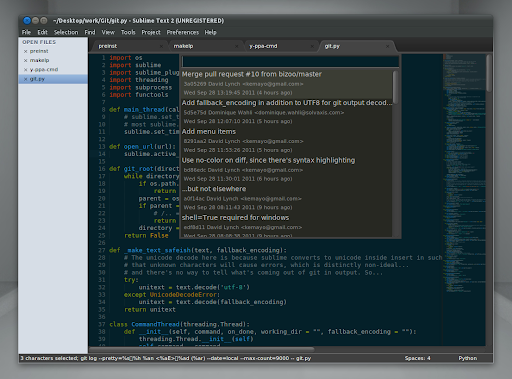 Sublime Text 2 is an excellent TextMate alternative (text editor) that runs on Linux, Windows and Mac OSX. The application is not free, but you can evaluate it for an unlimited amount of time. I've recently stumbled upon (via HK) a GIT plugin for Sublime Text 2 which can display a log or diff, do a quick commit and a few more basic Git commands. It doesn't support every Git command, but it's a nice addition for those of you who are using Sublime Text 2. The Git plugin, just like Sublime Text 2, is cross-platform and easy to install too! Then restart Sublime Text 2 and you'll find the new Git plugin under Tools > Git. For more info, Windows installation instructions, etc., see the Sublime Text 2 Git plugin wiki page. If you use Ubuntu, check out our Sublime Text 2 PPA - constantly updated with the latest development builds.